SQL, WCF, WPF, TFS, CLR, CSS, HTML, JS, etc. The Dallas Azure User Group will be meeting tomorrow at the Microsoft offices in Irving for our second meeting. I'm teamed up with Mike Holdorf and Rob Vettor to discuss Azure storage, namely Blobs, Tables, and Queues. The listing below is the document that I put together to hand out at the meeting with the "Details and Limitations". This should help us in our application designs as we move some of our systems to the cloud. These details are from the current SDK help file. Woohoo!!! The Azure Services Training Kit was updated this week. Well, maybe it's not that exciting because it means more work or "fun" training. It all depends on whether the sun is shining and I can ride the Goldwing. It's overcast and very windy so I'm "enjoying" the Azure Services Training Kit Labs. I walked through some of the labs this weekend, primarily the Blobs, Table, and Queue labs to better prepare for our Dallas Azure User Group talk on the 18th of this month. Mike Holdorf, Rob Vettor, and I are teaming up to present the topic of Azure Storage. It should be noted that the labs use the very useful SDK wrapper to abstract all of the REST complexities. So if you want to learn everything about Azure REST calls and how to handle retries and storage details, peek into the SDK example classes. In most cases, people just want to get the job done so these high level labs are very useful. I saw the "If I Ran Microsoft" video online today. It mentioned the public image for Microsoft and the great things that they do. 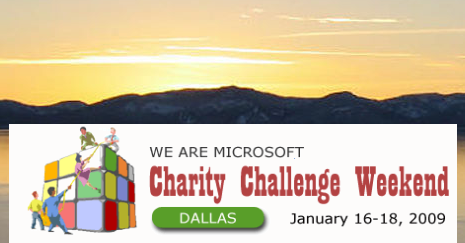 The video showed the "We Are Microsoft Charity Challenge Weekend". It was a big deal for those charities that now have a great system to do their charity work with. I'm so glad that I had a part in it this year. I compiled these Azure Platform Services related resources and distributed them to the Cloud Computing User Group in Dallas on 01/21/2009. It feels great to get back in action like when I was always running the Dallas C# SIG. Now I'm helping Mike Holdorf and Rob Vettor run the CCUG in Dallas. The first meeting is finally here (tomorrow). This invite says it all. "We are Microsoft" is this weekend!!! This event is all about giving a helping hand using our special talents to build solutions for non-profit organizations. If there's more team work than that, please let me know. For those who haven’t heard of the Managed Extensibility Framework (MEF), a CodePlex project, there is a good episode of .NetRocks with Glen Block to explain it. Some time back, I gave a talk at the Dallas ASP.NET User Group on the topic of "Debugging with Visual Studio 2008". In case anyone can find the notes, slides, and demos useful, they are located at http://www.dallasasp.net/Meetings/238.aspx. Some things have changed since Silverlight has gone RTW (Released To Web/World). Here are some notes and a list of questions and answers regarding the TFS Reporting architecture. I gave a presentation at this month's Dallas Visual Studio Team System user group. The topic was TFS Reporting but what we really covered was the TFS reporting architecture. We’ll probably follow-up with a second session of “Effective TFS Reporting” to include demos and the meaning of some of the most used TFS reports. I strongly believe that the TFS Reporting architecture includes several areas that should be understood to effectively and efficiently deliver standard and custom reports. So here are some high points for the benefit of others looking for answers. Bill Lodin is presenting a very informative 4-part webcast series on Silverlight 2.0 (beta 1). In Visual Studio Team System Database Edition, three types of functionality are unit tested; Stored Procedures, Functions, and Triggers. It’s not so obvious how to test a trigger and at this time there are not many examples. This is probably because there are so many different testing needs. Testing the trigger is very similar to the more obvious calls to stored procedures and functions. This example shows how a trigger can be unit tested using the RAISERROR method to cause a test harness failure. Two other methods exist to perform unit testing failures for those complicated tests. Last night’s North Dallas .Net User Group meeting was really good. Peter Debetta presented new features on SQL 2008. All of it was really interesting and will eventually be useful. I wouldn’t want to rehash all of the Microsoft documents and other blog information, but I will say that there are some useful features on the way. There are several ways to get an id from a requested form and set it as a request parameter on a subsequent web request. Remember that the querystring parameters are used on the form request before the form is retrieved and the extraction rules occur after the form has been received. This is all to ensure that the response to a formatted request was as expected. Day one of VSLive! Dallas 2006 came and went. It was an all-day presentation by Rocky Lhotka covering his CSLA framework. I used it a few years ago and was not nearly as impressed as now. Rocky has evolved this framework to be extremely flexible, well-designed, and still free. Add that to a day of training at DunnTraining.com to get a serious development jumpstart. Think about it... a top consultant's help at the price of a book. Beat that!